Okay, I know that technically, this can't be called a risotto because it isn't made with arborio rice, but if Weight Watchers wants to call it a risotto, I will too. My sister and I were talking recently about using barley, but I didn't have any recipes. Imagine my surprise when I opened up my WW Weekly on Saturday morning before my meeting. There it was. 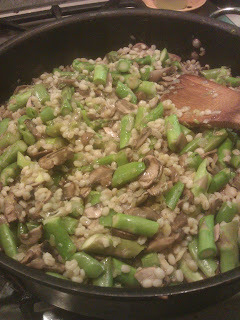 Barley and spring vegetable risotto. I sent her the recipe and she made it this Sunday. She said she added more vegetables, so it made 6 servings instead of 4. I am all for adding more vegetables than a recipe calls for. Zero points and I get to eat more. Yay! So I did the same, doubling the asparagus and the snap peas, plus I cooked up all of the mushrooms I had in my refrigerator and added them too. In my haste to shovel some of the finished risotto into my mouth, I completely forgot about adding butter, too. Oh well. Tasted awesome without it. The good thing about this recipe? Everything in it is on the Simply Filling Foods List. (I'm not counting the olive oil, since you're supposed to get a healthy oil that you don't count when you follow Simply Filling.) I need to get back to following this plan. It worked so well for me in the past, and I've been in such a rut. I haven't officially started, since it's mid-week, but my new goal is to eat whole foods, nothing processed, for a week. Last night I had some of The Aussie's sandwich roll and a few Hershey's Kisses, so yesterday didn't count. Eating whole foods, not processed crap, is a good goal. So enough of my dithering on, here's the recipe! First up: Heat up a large pan over medium high heat. When it's hot, drizzle a tablespoon of olive oil. Add the mushrooms and cook them down. This should take about 10 minutes, and you'll need to stir them frequently. When cooked down, remove from the pan and set aside. Next: Drizzle in your second tablespoon of olive oil. Add the minced scallion to the pan and cook until they start to get translucent, about 2 minutes. Add in the leeks and cook for another 7 or so minutes, stirring so they don't scorch, until they start to cook down. Now it's time to add the barley, stirring it around so that it gets coated with a little oil. (I have to tell you, I didn't think 3/4 of a cup of barley looked like much. Wrong.) When it's coated (I won't tell on you if you add a little more olive oil), pour in the stock. Bring it to a light boil, reduce heat to medium low, cover and simmer. The original recipe says 30 minutes, but mine took closer to 40 minutes. When the barley is almost tender, but still has a bit of chewiness to it, add in your vegetables, stirring well, and add your seasonings. Again, the recipe says 3-5 minutes, but I still had a lot of broth left to be absorbed by the barley, and a lot more vegetables to cook. Uncovered, I cooked the risotto an additional 15 minutes so that it was the proper consistency. Remove from heat, stir in cheese and lemon zest, and your dill, if you're using it. As I said above, I simply sprinkled a little cheese on top of my serving. Because of all of the vegetables I used, this made 6 huge servings. This sounds really good! I may have to try it. I've been wanted to do a homemade Risotto FOREVER!! I'm looking over all the ingriedents and my mouth is watering. Not kidding.